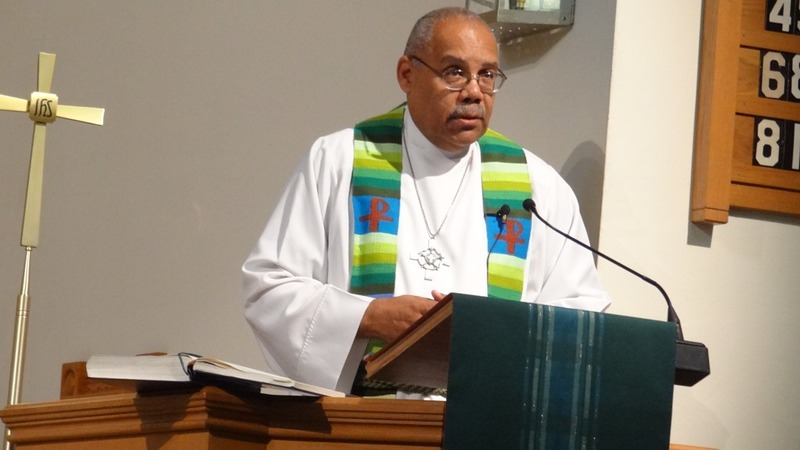 Sunday, August 3, 2014, I preached and presided for the final time at The Lutheran Church of the Covenant. Again I offer my sermon as a blog post rather than write a separate reflection on the event. Perhaps at a later date I will summarize the range of emotions I experienced that day. But for now, here is what the good people of God at Covenant heard last Sunday morning. I don’t have to tell you that this is the final time I will be in this pulpit as your pastor and of all the sermons I’ve written this one was the most difficult and will perhaps be the most emotional. I struggled with writing it and I’m not really sure that it says everything I would love to say to you today. So even though I seldom do so, at some point I may go off script if the Spirit moves me. The next time I step into this pulpit will be as your bishop, and hopefully, to install your next pastor. Another factor that makes this a tough preaching assignment is the question of what do I talk about? How does a Pastor go about summarizing his thoughts as he leaves a congregation he has served for five years; and in the course of that sermon, how does he go about saying goodbye to the people in this congregation that he has come to know and dearly love over that five-year span of time. My role as a preacher is to preach the grace of our Lord Jesus Christ, the love of God and the communion of the Holy Spirit. Knowing that and holding in tension all those other things I’ve mentioned makes for a tough assignment. Anytime a Pastor leaves a congregation to serve another, there are a range of emotions that go through the members of that church. Please keep in mind that it was the work of the Holy Spirit that led you to call me as your pastor back in 2009. 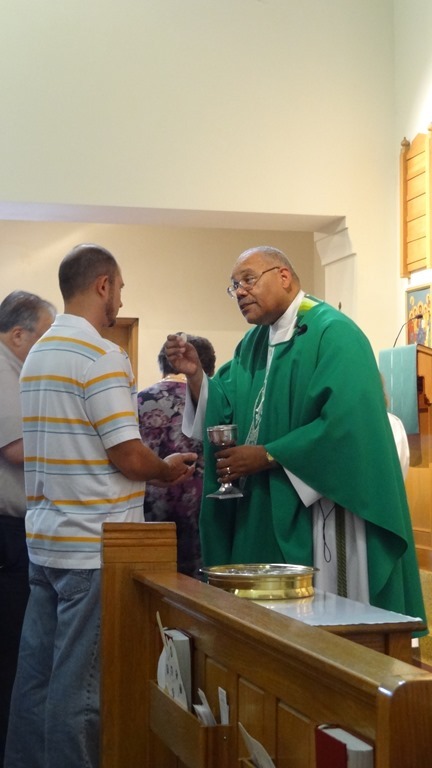 In a similar manner, at the Northeastern Ohio Synod Assembly last May, it was the work of the Holy Spirit that led the people gathered there to elect me as their next bishop. I wrestled with that. But the wrestling is over. God won, as God does all the time. Some of you are still hoping for a do over of the results. But in the end, I’m not the one who is in charge of my life, where I will live, or what congregations I will serve, It’s God’s call, not mine, not yours. One great piece of advice I received was, above all, to make sure the final sermon I preach points people to Christ and not attempt to resolve personal or congregational issues through the sermon, that is unless you want to have the people point the pastor to the door. And today’s gospel text on the feeding of the five-thousand is, in my opinion, one of the richest passages in all the gospels if not all of scripture. It is so full of teachings and truths that it cannot and must not take a back seat to whatever desire I might have to take a trip down memory lane with you today. This will not be a revival the old Ralph Edwards television show, This Is Your Life. But the single most wonderful element I found as the common link between this text and the one outstanding characteristic of this congregation is – FOOD! All summer long we have been gathering with the Lutheran Church of the Master for our Wednesday Picnic and Praise where we study the readings for the upcoming Sunday after we have shared a meal. On Thursday evening the Lutheran Church of the Covenant served some 60 people at our monthly Covenant-Hope Community Meal. On Friday evening, at the closing celebration of Camp Covenant we closed with a meal. During today’s liturgy we will celebrate the Lord’s Supper and following the liturgy we will gather once more for a time of fellowship and a meal. And today’s text has as its central topic the feeding of five thousand men, in addition to countless women and children. Are you beginning to see a pattern here? The love of FOOD is not an attribute that is the exclusive property of Lutherans. Even in Jesus time the table was central to people’s daily life as well as their life of faith. There are a couple of things I think we need to focus on in this text. The first is what happens when Jesus sees the multitude of people gathering to see him. Matthew says that he had compassion on them. Hear those words again. He had compassion for them. Jesus, who has just learned of the death of John the Baptist, is dealing with his own sense of grief and loss, but he had compassion, not for himself, as he had every right to have, but for them – for others before himself. Jesus meets the needs of others in his life of obedience to God even if it meant giving up his own desire for solitude. How do you feel when you watch the news and you see time and time again reports of people starving? How do you feel, when you hear that congress refuses to act on legislation that will extend tax credits to the millions of America’s working poor? How do you respond to their plight? It is compassion that orders Jesus’ relationship with humanity. It is compassion that directs him to care for those who seek him. It is compassion that prompts him to ask the disciples to figure out how they were going to find enough bread for the people to eat. He wants to meet their needs, and he wants to see those needs met. This feeding miracle encourages us to look not only at the ministry of Jesus but also at the ministry that we share as the Church – the body of Christ. Like us, Jesus’ disciples also struggled with the enormity of the problem and suggested to Jesus, “Send the crowds away so that they may go into the villages and buy food for themselves” (v.15). The disciples are being very practical here. The people need to eat, and they are all in the middle of nowhere. And that brings us to the second point that we should focus on and that is the words of Jesus to his disciples, “They need not go away; you give them something to eat” (v.16). YOU give them something to eat. This command is often missed when people read this story, and not many people get the point that Jesus makes here. How familiar does this sound to you? You can hear words like this just about any time, especially when there is a social or political problem that requires an infusion of resources. Or, to bring it closer to home, when our church is challenged to test our faith—when we are challenged to believe in God’s power to do the impossible in the midst of the reality of the situation that surrounds us. There is no way the disciples can feed such a large crowd. They barely have enough food for themselves! WE barely have enough for ourselves without taking on the struggles of the hungry in the world. And so they remind Jesus, “We have nothing here. Look, we’ve got five loaves and two fish” (v.17). Jesus tells them to bring him what food they have. Jesus takes the five loaves and two fish, blesses and breaks them, and what happens next is astonishing. Jesus provides abundance – more than what is needed. In fact, there are 12 baskets of leftovers! All in the crowd were fed, and there was a huge amount left over, even after more than five thousand people had eaten! Jesus had once again provided for God’s people in their time of great need. The reason for the disciples’ resistance is that they don’t have the physical resources to feed the crowd. They weren’t necessarily being cold-hearted in their refusal to feed the crowds, but they just didn’t see how it was possible. Jesus reminds the disciples to bring all that they have to him. It is only when the disciples bring their loaves and fish to Jesus that the miracle takes place. How many times in the life of the church do we look around, and all we see is what we don’t have? We look at our meager resources and think, ‘we don’t even have enough here for ourselves, much less anyone else’. The disciples had 2 loaves and 5 fish, but couldn’t see any possible way that God could use that. And yet they forgot that God created the world from far less than that. What little have you got to offer the world or to offer God? What little do we have in our church to offer? Humanly speaking, you and I have very little to offer, far too little to make any difference anyway. Our faith is imperfect. Our leadership skills are imperfect. Our ability to see others’ needs is often poor. Our compassion is not what it could be. And just look at our hungry world! Look at the people in our own community who are desperate and lost. Look at the generations of kids in our community who do not know Jesus Christ and have not heard the Gospel! It is tempting to hold our hands shut and say that we need these things for ourselves. It is easy to fall into the trap of thinking that unless we have enough to start with then we can’t help. Our whole existence as church is by faith, so let us not base our ministry on anything but faith. If God presents us with an opportunity, let us look for ways that we CAN do it, rather than looking at what we’ve got and then decide whether or not we can do it. It’s a big difference. But it’s the difference between a church stepping out in faith and a church that just exists. Jesus says to us, no matter how meager our resources, “Bring them to me.” What we have might not be sufficient in our eyes, but Jesus can take what we offer and produce a bountiful harvest. All we did was allow the children the opportunity to enter our building for seven weeks and learn about Jesus. I want you to take these words to heart and remember: that’s the reason God worked through the call process in the spring of 2009 to bring me into your lives. Remember how you fretted about whether you had enough to pay a full-time pastor? Remember how you focused on what you lacked instead of what you had? Yes, the congregation was aging and attendance was declining – it still is. But what you are doing with so little is a testament to the faith that you have demonstrated at least during the time that I have been with you. I feel that God called me here to proclaim to you two things every time I stepped into this pulpit: 1) How much God loves you and forgives you, and 2) to invite you to listen and draw closer to God, through reading and engaging in God’s Holy Word. That promise was for each and every one of you who believed in Jesus Christ, and turned to Him in repentance and faith. That was the reason God allowed our paths to cross these past five years, so that you would hear that message from the Word of God each week. So that you would be able to hear of God’s great love for you. I wasn’t the one giving the forgiveness, I was merely the chosen instrument God called to bring this about so that you would be strengthened in your faith in Christ. And it has been a great joy to see many of you grow in your understanding and faith in that time. It has been a privilege to bring that comforting message of the Gospel to you in good times, and bad times. 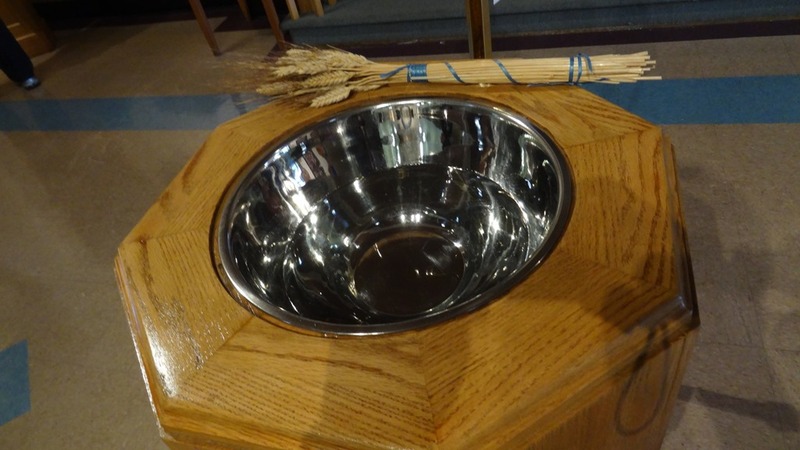 At the baptismal font, on a wedding day, or by the graveside of one you loved who had died in the faith. So remember on this, my final day with you, that God loves you with an everlasting love. Then the second thing I want you to remember going forward is that you are instruments of God’s love for others. And when we say, “We don’t have enough,” Jesus doesn’t let us off the hook so easily as we would like. However. He says, “Bring what you have here to me.” He takes them into his hands, and blesses what little we have and multiplies it. 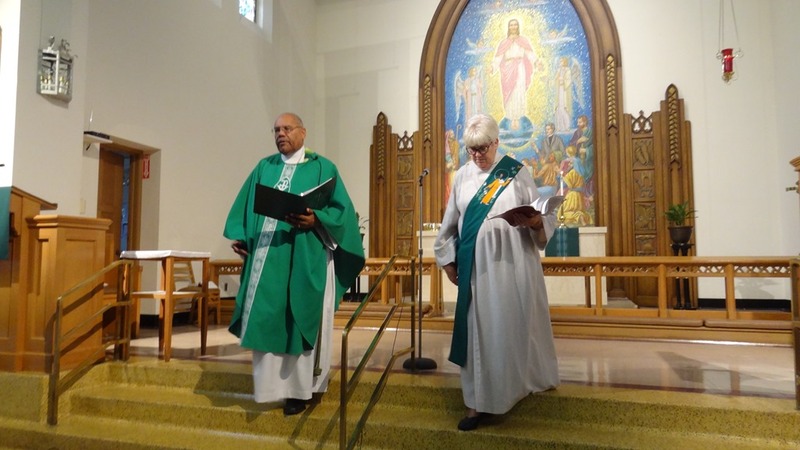 A loaf to Lutheran World Relief; another loaf to the Southeast Clergy Hunger Center; another loaf to Meals on Wheels; another our Covenant-Hope Community Meal; another to Lutheran Metro Ministries; yet another to LAOS; to Calvary Lutheran Church, and on and on. Our Lord gathers all what little we have in his hands, blesses them, and gives them through us, his disciples, along with a multitude of others who have heard the “YOU” in this text and along with many other resources for a multitude of other causes and associations and institutions and humanitarian societies addressing the distress of the world, to thousands and even millions. So our poor little loaves and fish nourish and support and shelter thousands upon thousands of nameless and faceless people spread across the face of the earth. Our little is multiplied beyond our comprehension. “We have only five loaves here and two fish,” we say. “It is enough,” Jesus says. This miracle reminds us that Jesus calls us into the ministry of God’s work in the world. We see this when Jesus gave the food back to the disciples. Jesus didn’t distribute the food. The disciples were his hands and feet. And by their faith they shared in the blessings that Jesus provided with all who were seated in the grass that day. They had leftovers – more than what they had begun with. It is God’s work, but it is done with our hands. So today, as I end my ministry in your midst, please remember that you, the people of God at the Lutheran Church of the Covenant, with the whole church, are still called to be the hands and feet of Christ and share in the abundant blessings of God. May we respond to needs of the world with compassionate hearts, offering all we have to Jesus, that he might bless it for us to share in the ministry of God. It has been a privilege and an honor to have been your pastor. I thank God for you and wish you all of God’s blessings. In the name of the Father, and of the (+) and of the Holy Spirit. Amen. May the God of Hope fill you with all joy and peace in believing, so that you may abound in hope, by the power of the Holy Spirit. Amen.